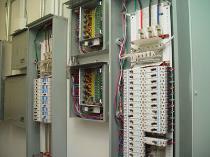 Are you looking for electrical contractors and electricians in Simi Valley, CA? If so, call the reliable, affordable, and experienced electricians of Barger Electric today for troubleshooting, repairs, and/or installations! Barger Electric offers a wide range of residential and commercial electrical services. From complete wiring of new construction projects to a few basic remodeling needs, Barger Electric is here to assist your every need. No job is too big or too small! ​ The electrical system of your home is like the body's central nervous system. Don't let just anyone attempt to fix a problem or install an outlet. You need a licensed, skilled, and trained professional electrician. Because Barger Electric specializes in electrical service and repair, our electricians arrive to your job equipped and ready work. Whether it's installing a new outlet or replacing your entire electrical panel, from new construction to remodels we'll get the job done right! ​ Since we are an electrical contractor business, we know how imperative it is to have the electrical components of your office working at all times. This is why we are the "go-to" electricians in Simi Valley when it comes to commercial electrical service. Barger Electric specializes in commercial electrical service and repair, our technicians arrive to your job equipped and ready work. We'll get the job done in a respectable and timely manner so your business is not affected any more than it should be.